A peer-to-peer system does not have a dedicated server. Every user may share folders on his or her hard disk and also share peripherals such as printers and fax modems. Every client may talk to every other client. Putting a fast and well-equipped server to work increases your productivity, enables smart backup and archiving, and vastly improves the security of your data. 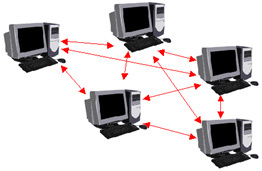 For small organizations and home users a peer to peer network may be appropriate. Installation and management is simple compared with server-based systems. Peer-to-peer systems typically use machines of a lower specification than dedicated servers. Peer-to-peer networks are difficult to manage because they are based on the concept that each user is responsible for his or her machine. For example, it is possible that one user might switch off his or her machine while another is using resources on that machine. Lack of security - the security relies on each user controlling access to the resources on their own PC. If security is an issue, these systems should not be used. Give us a call to discuss what’s best for your business.